[tweet username=”exhibitcore” layout=”none” text=”free floor plan software launch”][fblike layout=”button_count” show_faces=”true” action=”like”]1/6/2011 – RC Media Group, Inc. has released ExhibitCore® Floor Planner Free Edition, the latest version of its online, interactive trade show booth design and sales lead generation tool for exhibitors, event planners manufacturers and retailers. ExhibitCore® Floor Planner offers lots of great features to enhance the customer experience in designing and visualizing their booth space with furnishings, products, exhibit modules and structures, as well as improved reporting and lead follow-up tools for the sellers and manufacturers. The ExhibitCore Floor Planner allows you to browse actual items from your trade show exhibit inventory, view product details and drag-n-drop the items right onto your floor plan. 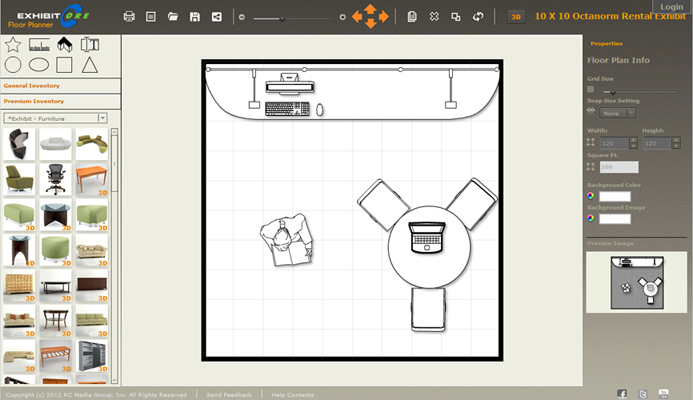 These products are automatically scaled to their actual dimensions allowing you to determine whether a certain item will fit in your floor plan layout. 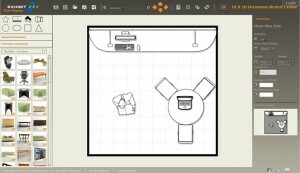 You can manipulate walls, dimensions, symbols and notes then share your floor plans and electrical layouts with team members or show management. Anyone can play around with the software before registering, but in order to save your floor plans and share it on facebook you must sign up for a free account. For more information, a live demo is available at www.exhibitcore.com/planner_index.html. Simply launch the demo floor planner, nothing to download or install. About RC Media Group, Inc.
ExhibitCore is a division of RC Media Group, Inc. based in Orlando, FL. Founded in 2004 and has become the industry leading online trade show management and event planning solution for exhibitors, Exhibit houses, Tradeshow Manufacturers. RC Media group offers effective business technology and marketing strategies – specializing in consulting, software development, advanced interactive technologies. Customizable technology and a focus on specific vertical markets are what set RC Media Group, Inc. apart from the rest. All RC media Group products come with unmatched education, training and personal coaching services, and award-winning technical support. For more information, go to www.exhibitCore.com.